Lynn Gottlieb is a pioneer feminist rabbi, storyteller, percussionist, peace educator, writer, ceremonialist, community activist and clown. She is deeply committed to a life grounded in the creativity, joy and wisdom of the Torah (teachings) of Nonviolence. Her journey includes life long activism with The Fellowship of Reconciliation and ongoing pursuit of Israeli Palestinian conflict transformation based on principles of active nonviolence. Since 1964, Lynn has engaged in multifaith, intergenerational and multicultural organizing around issues of economic and racial justice, gender justice and ‘the demilitarization of land and life’. Lynn served as a pulpit rabbi from 1973 to 1980 with Temple Beth Or of the Deaf and Mishkan, An Experimental Shul in NY and from 1981 to 2005 with Congregation Nahalat Shalom in Albuquerque, NM, which she co-founded. Click here to visit her website. You can also follow her on Facebook, where she posts frequently. 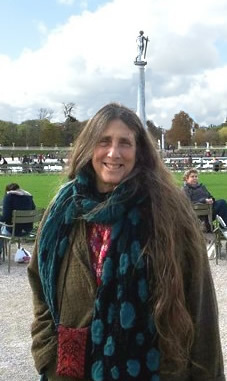 Rabbi Lynn is co-founder of Open Tent Shul of the Arts and a Freeman Fellow at The Fellowship of Reconciliation. Rabbi Lynn has created a beautiful new hagaddah for our time: The World Beyond Borders Passover Hagaddah for the Entire Year. You can purchase it through her Etsy site. You can contact her at rabbilynn@earthlink.net or call 805-259-5030.